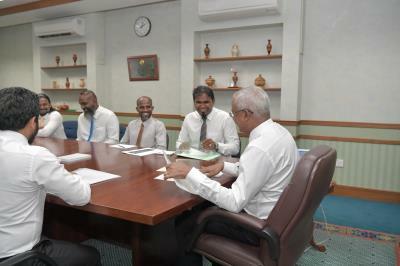 President Ibrahim Mohamed Solih has this afternoon met with members of the Hinnavaru Council of Faadhippolhu Atoll. 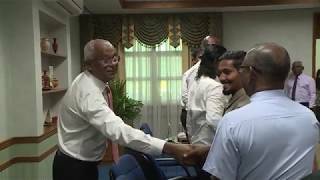 At the meeting held at the President’s Office, members of the council shared their concerns and future development projects planned for the island. The Councilors especially noted the challenges being faced due to the shortage of housing units, and damages in the current harbour. Speaking further they highlighted the request of the youth in developing current football ground and Youth Center. They also highlighted that they want to upgrade the existing ferry system. Moreover, they shed light on challenges being faced due to lack of space in the council office. In addition, the councilors requested to speed up the work of transforming the health center to a hospital. During the meeting, President Solih reassured of the administration’s continuous support to resolving the issues faced by the people.